Heat oven to 350°F. Place mini paper baking cup in each of 24 mini muffin cups. In medium bowl, mix flour, baking powder and salt; set aside. In large bowl, beat butter with electric mixer on medium speed 30 seconds. Gradually add sugar, about 1/4 cup at a time, beating well after each addition. Beat 2 minutes longer. Add 3 eggs, one at a time, beating well after each addition. Beat in vanilla. On low speed, alternately add flour mixture, about a third at a time, and milk, about half at a time, beating just until blended. Fill each cup with about 1 tablespoon plus 1 teaspoon batter or until about two-thirds full. (Cover and refrigerate remaining batter until ready to bake; cool pan 15 minutes before reusing.) Bake 17 to 20 minutes or until golden brown and toothpick inserted in center comes out clean. Cool 5 minutes; remove cupcakes from pans to cooling racks. Cool completely, about 15 minutes. Repeat with remaining batter to make an additional 48 mini cupcakes. In medium bowl, toss coconut, green food color and 4 to 6 drops water with fork until coconut reaches desired color; set aside. Remove paper baking cups from 64 cupcakes (reserve remaining cupcakes for another use). Cut each cupcake horizontally in half to make tops and bottoms of “buns.” Place brownie rounds (burgers) on bottom halves of cupcakes (buns), using frosting to secure. In small bowl, mix honey and enough of the 1 to 2 teaspoons water until thin consistency. Brush honey mixture lightly over “bun tops"; sprinkle each with sesame seed. Spread dab of frosting on cut sides of “bun tops"; secure to coconut, frosting side down. Brownies can be baked ahead, but wait to cut out the "burgers" until ready to assemble so the burgers don't dry out. 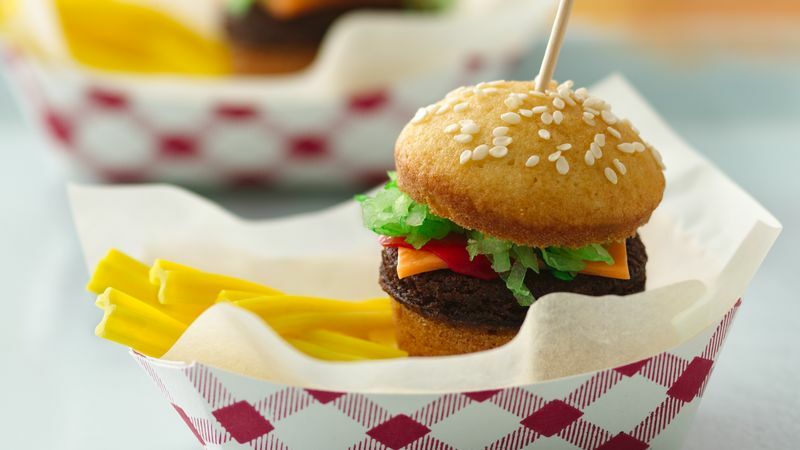 For a fun touch, serve these "sliders" in red and white checked paper food trays, like at a fast-food restaurant, accompanied by "fries" (yellow licorice twists).